The F-35 Lightning II has gotten a lot of crap all over the world for being both finicky to actually put into combat, and also for having stealth that doesn’t really work all the time. To prove it can both fly in the air and do it over enemy territory without being spotted by radar, Israel just released this photo of one flying over Beirut. All casual-like. While Israel is mired in yet another conflict with the Palestinians (over 60 dead and counting on the border with the Gaza Strip), it’s also quite a bit mired in the Syrian Civil War, just like many other nations. As such, Israeli jets tend to fly over and around Lebanon when they fly into Syria to bomb Iranian, Syrian, and Hezbollah targets. But most casual observers probably just assumed they did it at very low levels, in the dead of night, very quickly, to evade both getting shot down and any international incidents that go along with, you know, violating an official enemy’s airspace. Not in broad daylight, with a photographer at the ready. So to understand how much of a dickish move this is, diplomatically, it’s a bit like if the United States flew an F-22 Raptor over Pyongyang just to show that it could. 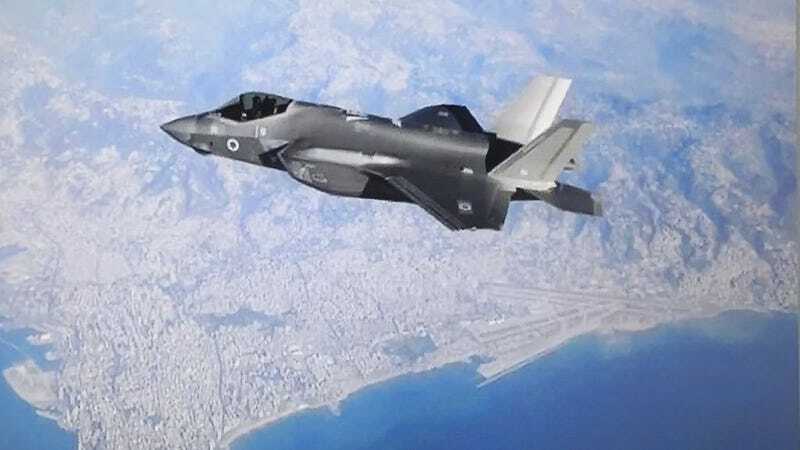 Israel is the first country in the world to carry out an “operational attack” with the F-35 stealth fighter, Israel Air Force commander Maj. Gen. Amikam Norkin said on Tuesday. “I think that we are the first to attack with the F-35 in the Middle East,” Norkin said. The air force chief was speaking about the Middle East, but this is the first known operational use of the new fifth-generation fighter jet in the world. And sure, it could all just be photoshop, but it’d be a pretty bold claim to make if you couldn’t back it up. Images like these are meant just as much, if not more so, for Israel’s enemies as they are for the Israeli public, the Americans who made the jet, or whoever else that sees it. Just as long as they don’t fly it through a rain cloud, or something.